Denise Murdoch of Chesapeake, Va. When I found out about the Green Power Program, I immediately felt empowered. I wish I had known about it sooner, so now I'm purchasing 100 percent. RICHMOND, Va., Nov. 28, 2018 /PRNewswire/ -- When Denise Murdoch of Chesapeake, Va., found out about Dominion Energy's Green Power® Program she knew it was a natural fit for her, and she describes why in this video. 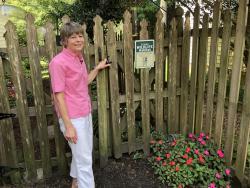 She is one of more than 30,000 Virginians who support the production of renewable energy and protect the environment by participating in the program. Since it began in 2009, the program has enrolled people from all walks of life – from homeowners and small businesses to large organizations who want to help reduce the need for traditional energy sources and create measureable environmental benefits. Locations of high participation levels – designated as Green Power Districts – are Ghent in Norfolk, and Scott's Addition, Riverside, Bellevue, Church Hill, and The Fan in the Richmond area. "Our Green Power participants have made a thoughtful choice," said Brett Crable, director of New Technology and Energy Conservation. "They are doing their part in helping to reduce our dependence on fossil fuels and build a sustainable energy legacy for future generations." How does the program work? When you enroll, Dominion Energy purchases Green-e Energy Certified® Renewable Energy Certificates (RECs) on your behalf. You can purchase RECs to match 100 percent of your electricity use each month for an additional cost of 1.3 cents per kilowatt-hour (kWh); or you can buy $2 fixed increments per month. A REC is like a receipt for the environmental benefits created when renewable energy is produced. It is a guarantee that one megawatt-hour of renewable energy was produced and delivered to the regional power grid. Your payment is used to support green energy from wind, solar and biomass facilities in our region. Murdoch said she's doing small things to reduce her carbon footprint. "I drive a hybrid vehicle, have an organic garden, use rain barrels and my backyard is wildlife habitat certified, but I felt that wasn't enough," she said. "When I found out about the Green Power Program, I immediately felt empowered. I wish I had known about it sooner, so now I'm purchasing 100 percent." In just one year, a customer choosing the 100 percent option and using 1,000 kWh of electricity per month will reduce carbon dioxide emissions by over seven metric tons – the same greenhouse gas reduction provided by 193 tree seedlings grown for 10 years, according to the Environmental Protection Agency. Dominion Energy's Green Power Program is listed in the National Renewable Energy Laboratory's Top Ten Utility Green Pricing Programs, placing 6th in enrollments and 9th in megawatt sales. The Grid Transformation & Security Act that became law in July set Virginia's energy policy on a course for a massive expansion in new wind and solar energy – 3,000 megawatts of which Dominion Energy is committed to having in operation or under development by the beginning of 2022. The projects will be a combination of assets developed and procured by the company.